Over the last half-century, Feeders Supply has become one of the country’s only local, family-owned and -operated multi-store pet retailer. “There are very few independents that have as many stores as we do,” said Pam Gibson Longwell, chief operating officer and daughter of the company’s founder, Roy D. Gibson. There are 14 neighborhood Feeders Supply stores – nine in Louisville, three in Southern Indiana, one in Shepherdsville and one in Elizabethtown. They sell supplies, food and services for household pets and became a member of the Louisville Independent Business Alliance in 2011. Feeders Supply’s success has been built steadily with a tried and true strategy: keeping the company’s core values it was founded on, while adapting to meet market changes and consumer needs.Gibson started Feeders Supply in 1959 as a feed-store serving area livestock farms, a natural step considering his agriculture background. He grew up on a farm in Spencer County, which the family still has. He earned an animal science degree from the University of Kentucky, married a Shelby County native, and they moved to Louisville to start their lives. The Baxter Avenue store was the original company location, next to the Bourbon Stockyards Co.
“Because so many farmers brought their livestock into town to market, there were many agribusinesses located around the yards. It just made sense to operate where everyone else was serving the farming market,” Longwell said. In the 1970s, Gibson added commercial accounts, including feed contracts for the Louisville Zoo and the Kentucky Exposition Center’s livestock show, which the company still holds. In the following decades, Gibson realized a new retail category was emerging - the pet food and supply store. Pet owners increasingly wanted higher quality food. Gibson converted the front of the Baxter Avenue warehouse into a retail store and began selling premium pet food. Gibson opened a new store nearly every year thereafter and was president and CEO until his death in 2004. 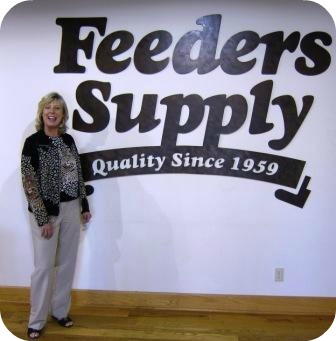 The Feeders Supply warehouse and distribution facility allows the company to purchase premium pet food, supplies and other items at a volume that keeps prices competitive. “Since we buy at the same cost as the big boxes, we’re able to pass the savings along to area pet lovers,” Longwell said. Employees are expected to support a positive shopping experience. New employees attend customer-service training, pet nutrition classes and monthly product seminars. “Our sales associates are pet lovers, too, and they work hard to help customers solve pet care issues using the items we have on our shelves,” Longwell said. The company donates space to the Kentucky Humane Society and other organizations for adoption centers. Through these centers, KHS finds homes for more than 3,000 pets every year. “We believe in the adoption option,” Longwell said. The company is always looking at possible new locations. And, they continue to find Kentuckiana a great place to be a local business.